Sure, it's close to Fall everywhere else in the world. Here in FL, we have a few months to go before we will see any significant break in temperature. More time to show off my fancy sandals, like Sand by Saya, which I am featuring today. These beauties got their start in NY, where all the fancy things are born. Sand by Saya makes their mark and lessens their environmental foot print by selling handmade and toxic free sandals. Their mission is to increase environmental awareness and make your feet happy. I love flip flops. I pretty much live in them during the summer. They can be plain Jane or exceptionally beautiful, like these sequin adorned shiny sandals. I took one look at the color of these Upper West Side style sandals and knew I had to have them. You can find them in the Crest section on their website. Turquoise Hasn't been a huge favorite in the fashion industry. It's kind of a misfit color that is finally being welcomed more into the spotlight.. Only select special people adore this color and I for one love it. Especially the contrast against my bright red toe nails. These sandals are incredibly pretty and honestly the pictures do them no justice. The shine and sparkle of the embellishments are gorgeous in the sunlight. The footing and straps are soft and durable and the straps are very shiny. They are the perfect sandal to walk along the board walk in. Pairing them with a maxi skirt and tank top would make the perfect chic outfit. I realize it's impolite to look down when someone is talking to you , but I can't help but keep staring down at them as I'm walking or just sitting still. Every chance I get I ooh and ahh, so beware of social etiquette being challenged in these beauties. 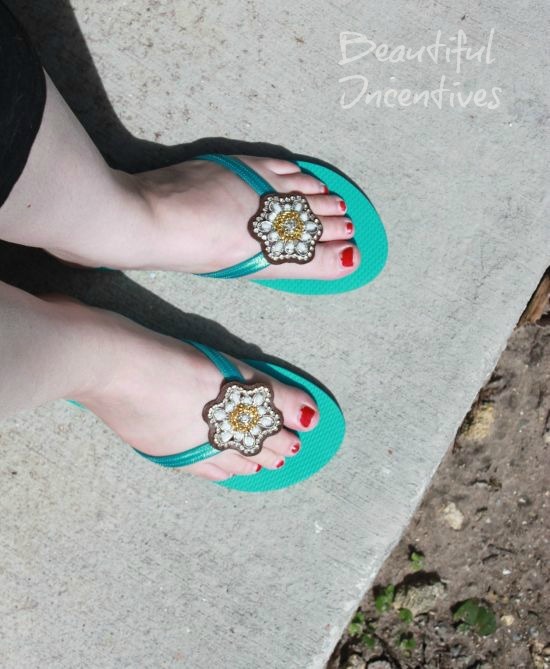 I have been wearing these summer sandals for over a month now whenever I can find something that matches. My favorite way to wear them is with my white linen pants and a matching shirt or a maxi skirt. They go with everything really , but can definitely up with a fancier skirt to go out to dinner, if need be. The embellishment makes them very versatile. 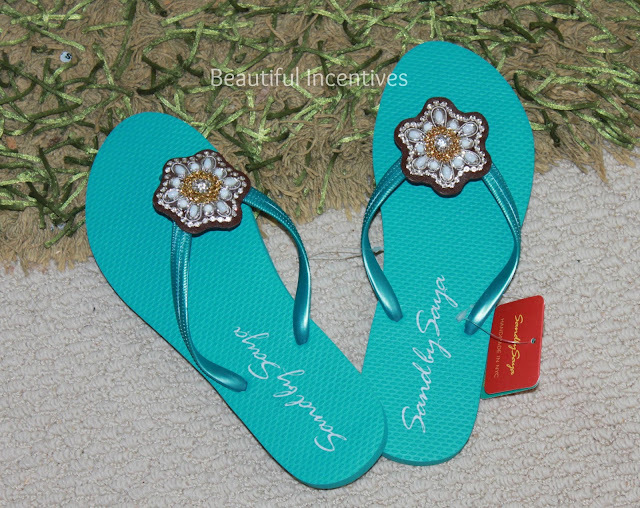 Sand By Saya NY also sells Accessories with the same designs as the sandals so you can mix or match! What I also love about this brand is that they give back. A portion of the proceeds from sales goes toward helping out Green Peace! Those are so cute! I love a good pair of flip flops that are stylish while keeping comfort.